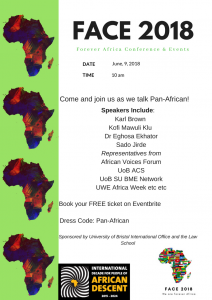 Introducing: The launch of the interdisciplinary Pan-African annual conference at Bristol!!! What is FACE: FACE [Forever Africa Conference and Events] is a Pan-African initiative brought together by staff and students at the University of Bristol. It has a goal-oriented, interdisciplinary, cross-sector, intergenerational, intercommunity, intercontinental vision to dialogue for the purpose of bringing change to the Pan-African community through knowledge cooperation. The launch event will be dedicated to setting a Pan-African agenda for the next 12 months and beyond. We are interested in setting long- and short-term goals that involve the cooperation of communities, HE staff and students, professionals, NGOs, corporations, etc. Creating a programme of events and endeavours across the year focused on the Pan-African ideal. FACE recognises itself as part of marking the International Decade for People of African Descent, proclaimed by General Assembly resolution 68/237 and to be observed from 2015 to 2024. We will also be launching the Innovation and Enterprise Award for students. Tickets are free, but please book by the 1st of June so we can have an idea of numbers for catering. If you want to know more about the conference, email us at info.face2018@gmail.com.